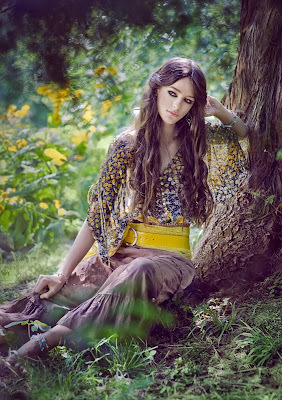 I heart this photo shoot, I think this is one of the most inspiring photo shoots I've ever found; every time I see these photos I feel happy because I really love the boho style! Some of my lovely readers were asking me about the photo of my header, that's why I wanted to share with you the whole photo shoot. This amazing work belongs to the super talented photographer Joanna Krusta, her work just blew me away! The colors, the styling, everything is just perfection. I selected some of my favorites for you to enjoy. Hope to inspire your day with these amazing photos! Adoro esta sesión fotográfica! Para mi estas fotos son unas de las mas inspiradoras que he encontrado, cada vez que las veo me siento feliz porque me encanta el estilo bohemio! Algunos de mis lectores me han preguntado acerca de la foto principal de mi blog, por eso decidí comparir con ustedes todas las fotos de esta sesión. Este trabajo maravilloso pertenece a la super talentosa fotógrafa Joanna Krusta, su trabajo me dejo sin palabras! Los colores, el look, todo es perfecto! Aqui les dejo algunas de mis fotos favoritas para que las disfruten. Espero haberles traído un poco de inspiración con estas fotos! beautiful images!! I love all the clothes! love all esp. the black and white photo!!! I was wondering about your header too... anyway, beautiful pictures! The one in the header remains my favorite. I love the one in your header but my next favourite is number 8. You have such a lovely blog, adding you to my reading list! i love the second one but also the one you also have on the header. 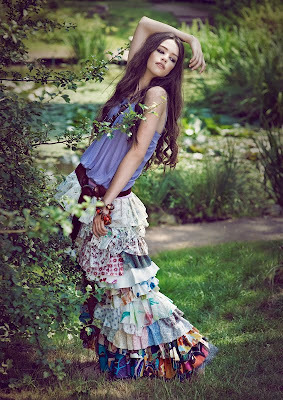 Like this kind of hippie style....and she looks beautiful! It's as if the photo is unexpected. That's what makes it look good. This is a gorgeous photoshoot. The model is gorgeous and the photography is great. I've always wondered about your header as well, and that one is probably my favourite from the shoot. This photoshoot has to be my favorite one that you've ever posted. They are all so beautiful. The model is gorgeous as well as the nature scene where they take place! p.s. your comment made my day! i'm so happy you got your peace owl goodies and that you adore it! i had fun sending them to you. :)hope you have a lovely day! peace & love. Inspiración Total! Me encantan los colores, el movimiento y los diseños tan bohemios, románticos, medio gitanos...que lindas fotos amiga! I absolutely love this photo shoot! And it is so "boho market." The photo shoot, like your blog, is talented, inspirational, intriguing and beautiful. Love love love. la 2 y la 8 muero por tener una faldas asi :( apesar de ello todas son super hermosas me inspiran mucho besitos hermosaaa que tengas linda semana :) tu siempre teniendo perfectos post Giova !!!! Para mí, sin duda, la 1, 2 y 6. Me parece una producción llena de frescura y me recuerda al tipo de fotos que se hacían en los primeros años 80, con modelos jovencísimas. Quizá a la mejor época de Elle y Giles Bensimon, cuando lanzaron a modelos como Claudia Schiffer con fotos así de frescas. i love the feel of pictures 3 and 11. but all of them are so pretty, the colors are beautiful! Is very perfect, this colors, look, everything. Oh wow I just found your blog : D It's amazing, keep up the great work! I LOVE this photoshoot, I can't pick a favourite - very inspiring! What a beautiful gypsy queen. I love the action shot with the coin belt! Number 9 is definetely my favourite. 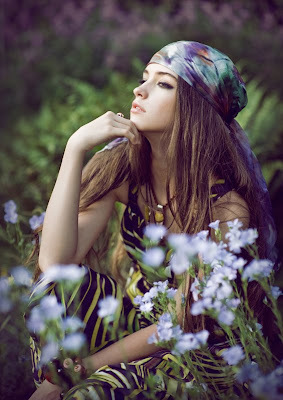 I love how she's just sitting in a patch of flowers with that gorgeous headscarf casually atop her head. absolutely love this post! Love the pics, the clothers and the model! She's gorgeous!! Tough decision - they're all marvelous! I'm going to say No. 9 is my favorite. Love it! Qué preciosidad de fotografías!! No sabría decir cuál me gusta más porque todas son espectaculares. Un beso enorme!! Thanks everyone for your lovely comments! You know I read each of them and I really appreciate you take the time to read my posts and make comments! Gracias a tod@s por sus lindos comentarios! Leo cada uno de ellos y aprecio mucho que se tomen el tiempo para leer mis posts y dejen sus comentarios! Wow, this editorial is amazing! It's so inspiring, no wonder it's your favourite photo shoot. I love the 5th picture. The black and white is so lovely. Beautiful photographs. Thanks for sharing! Love your blog, by the way!! Me encanta este estilo... te agrego a mi blog. the great thing about the photos is that they tell a story. there is mystery and it makes the viewers wonder.